Rosemary oil is a natural substance applied in many areas of life. It’s mainly used for skin and hair care as well as in the treatment of many illnesses. The product is also used for massage, aromatherapy, baths and inhalation. What are the properties of rosemary oil? What are the uses of rosemary oil? The cosmetic is antiseptic, antibacterial and antimycotic. It improves natural immunity and strengthens condition of human organism. Also, it enhances memory and concentration, heals apathy, stimulates blood circulation in skin cells and regulates blood pressure. It helps to treat nervous and immunological systems. It alleviates symptoms of epilepsy, rheumatism and other chronic diseases. What does rosemary oil do in skin care? It has a positive influence on body and face skin. It makes skin firm and elastic, helps to fight cellulite and stretch marks. It is recommended to people who struggle with oily and acne-affected skin with enlarged pores. 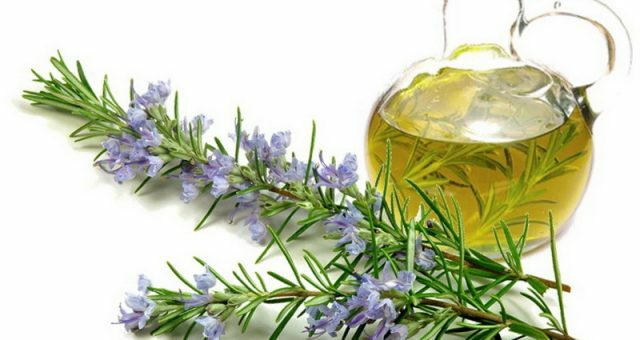 Rosemary oil lightens post-acne and post-sun scars, soothes inflammation of the skin and reduces acne. What’s more, it smooths wrinkles, speeds up regeneration of epidermis cells and improves the condition of body and face skin. What is the influence of rosemary oil on hair and scalp? The cosmetic is designed for hair and scalp care. It reduces dandruff, prevents oily hair and regulates work of sebaceous glands. Also, it alleviates irritation and inflammation of the skin, strengthens hair bulbs and follicles and improves hair condition. It provides strands with shine, smoothness and moisturizing as well as restores split ends, prevents hair from drying off and chemical and mechanical damage. Rosemary oil gives protection from UV radiation, low temperatures, impurities of external environment, some ingredients included in colouring and cleansing hair and scalp products. How to use the oil properly? Apply a few drops of product directly to head and strands and massage gently. You can also add small amount of the oil to your favourite mask or conditioner. Then you apply it to the scalp according to the instructions provided on the package of the conditioning product. Rosemary oil can be used for hair oil treatment. It’s enough to apply a few drops of the cosmetic to clean and damp hair. After ca. 30 minutes wash your head with cool water and delicate shampoo.